Per capita healthcare costs for severely or morbidly obese adults (BMI >40) are 81 percent higher than for healthy weight adults.6 In 2000, around $11 billion was spent on medical expenditures for morbidly obese U.S. adults. Reducing obesity, improving nutrition and increasing activity can help lower costs through fewer doctor’s office visits, tests, prescription drugs, sick days, emergency room visits and admissions to the hospital and lower the risk for a wide range of diseases. A 2008 study by the Urban Institute, The New York Academy of Medicine and TFAH found that an investment of $10 per person in proven community-based programs to increase physical activity, improve nutrition and prevent smoking and other tobacco use could save the country more than $16 billion annually within five years. That’s a return of $5.60 for every $1 invested.9 Out of the $16 billion, Medicare could save more than $5 billion and Medicaid could save more than $1.9 billion. Also, expanding the use of prevention programs would better inform the most effective, strategic public and private investments that yield the strongest results. 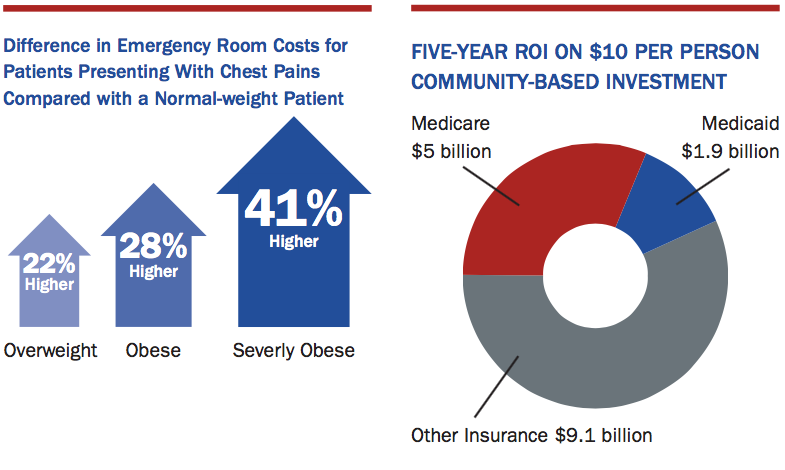 1 Cawley J and Meyerhoefer C. The Medical Care Costs of Obesity: An Instrumental Variables Approach. Journal of Health Economics, 31(1): 219-230, 2012; And Finkelstein, Trogdon, Cohen, et al. Annual Medical Spending Attributable to Obesity. Health Affairs, 2009. 2 Cawley J, Rizzo JA, Haas K. Occupation-specific Absenteeism Costs Associated with Obesity and Morbid Obesity. Journal of Occupational and Environmental Medicine, 49(12):1317?24, 2007. 3 Gates D, Succop P, Brehm B, et al. Obesity and presenteeism: The impact of body mass index on workplace productivity. J Occ Envir Med, 50(1):39-45, 2008. 4 The Robert Wood Johnson Foundation, the American Stroke Association, and the American Heart Association. A Nation at Risk: Obesity in the United States, A Statistical Sourcebook. Dallas, TX: American Heart Association, 2005. (accessed April 14, 2008). 5 Finkelstein EA, Trogdon JG, Cohen JW, Dietz W. Annual Medical Spending Attributable to Obesity: Payer-and Service-Specific Estimates. Health Affairs, 28(5): w822-831, 2009. 6 Arterburn DE, Maciejewski ML, Tsevat J. Impact of morbid obesity on medical expenditures in adults. Int J Obes, 29(3): 334-339, 2005. 7 Teuner CM, Menn P, Heier M, Holle R, John J, Wolfenstetter SB. Impact of BMI and BMI change on future drug expenditures in adults: results from the MON-ICA/KORA cohort study. BMC Health Services Research, 13(424), 2013. 8 Peitz GW, et al. Association of body mass index with increased cost of care and length of stay for emergency department patients with chest pain and dyspnea. Circ Cardiovasc Qual Outcomes, 7(2): 292-298, 2014. 9 Trust for America’s Health. Prevention for a Healthier America: Investments in Disease Prevention Yield Significant Savings, Stronger Communities. Washington, D.C.: Trust for America’s Health, 2008. (accessed April 2013).